Coast Survey chart of the Florida Peninsula. Sketch F Showing the Progress of the Survey in Section VI. With a General Reconnaissance of the Western Coast of Florida 1848-51. A beautiful coastal chart of Florida by the U. S. Coast Survey, 1851. 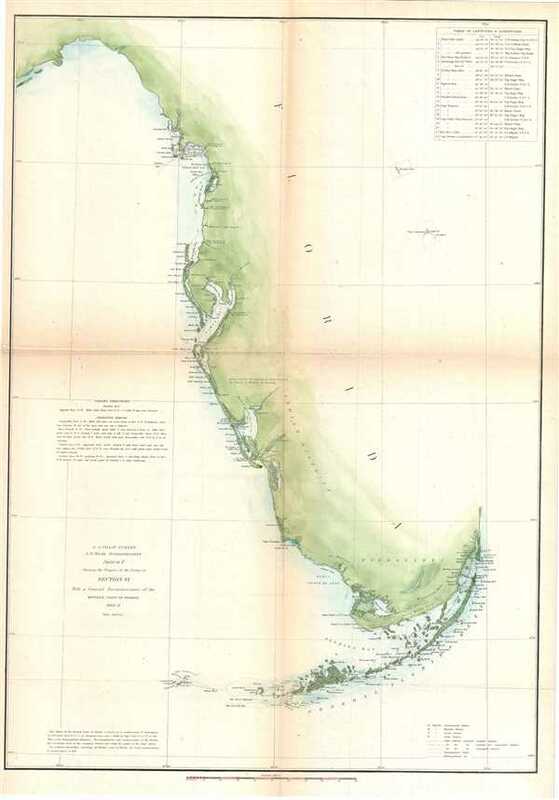 Depicts the whole of the Florida peninsula, but specifically details the western coastline, showing all bays and harbors, as well as an accurate mapping the Florida Keys. Shows few internal features, however, does note the Mangrove Swamps and Indian Hunting Grounds near the Everglades. With the exception of the Key Biscayne Bay (Miami) area, the eastern coast of Florida is largely without detail. A table in the upper right hand quadrant features latitudes and longitudes for important Florida destinations. Sailing instructions above the title area in the lower left quadrant. The reconnaissance for this chart was accomplished by F. H. Gerdes and Captain Casey. Produced in 1851 under the Supervision of A. D. Bache, the most influential leader of the Coast Survey. Very good. Minor wear and toning on original fold lines. Backed on archival tissue.